It is a couple of weeks short of when Spanish horror punks The Monster Ones first burst into our welcoming crypt two years ago with their impressive slice of danger, the I Wanna Be A Teenage Monster EP. The second release from the band it was a feisty and bruising slab of mausoleum rock ‘n’ roll with punk attitude and glam rock wantonness. It has been a seemingly long time for the next episode of their death soaked enterprise but the patience is tested no longer as their debut album has been uncaged to ravage ears and stir up passions. Twelve slices of horror bred contagion, We Are The Monsters is an unbridled web of sonic intrigue and blood drenched grooves spiked with an addiction forging toxin as potent and impressive as any unleashed so far this year. Formed in 2008, the Palma de Mallorca band soon made a strong scar locally with their blend of punk, blues, and rockabilly infused with healthy doses of glam and hard rock. It is a sound which is recognisable in many ways but unique in just as many others. The release of the Transilvania Rock City EP in 2010 drew them good attention but it was I Wanna Be A Teenage Monster two years later which stirred up greater awareness and appetites for their emerging menace, the band becoming regulars on our Bone Orchard podcasts alone. It is easy to feel that the release of We Are The Monsters could be the anticipated trigger to a stronger spotlight on the band with its striking range of flavoursome and deathly stabs of prime rock ‘n’ roll. Time is always the unveiling of reality but with the deaf and dead possible exceptions, it is hard to imagine true rockers not losing their inhibitions over this scintillating rampage. Led by the fiery tones of vocalist Cecile The Beast alongside the rapier riffs of guitarists Carpi Malone and V, as well as the thumping beats of drummer Maf, The Monster Ones go straight for the jugular from the first seconds, teasing, taunting and seducing with unbridled rapaciousness. Aided and abetted by bassist Elvis Lugosi throughout the encounter with occasional guest backing vocals from Alex Femenías, the band lays a bait of rhythms and acidic guitar around the ears to open up first track Monster Heroes. Soon into its stride a blues lilt soaks the melodic flames of the song whilst drums crisply jab and the bass prowls around the senses alongside more straightforward raw riffing. The vocals of Cecile are as potent as the sounds, her delivery powerful and inflammatory easily leading the appetite to a full engagement with the anthemic chorus. It is a more than solid introduction of heavy rock, nothing dramatically grabbing, that comes later, but fully enjoyable. Once the throaty bass line courted by intimidating beats hits the ears as Alien Paradise appears, an even greater exciting outlook breaks out. The twin attack has total slavery of thoughts and emotions by the time Cecile and soaring guitar swipes join the affray. Into its stride the track is an adventurous punk tempest with broadly swinging rhythms and raging guitar causticity bringing a mix of The Duel and The Creepshow to the rampancy. It is one of those encounters where feet and personal exploits are no longer yours to command, a criminally addictive rampage impossible to get enough of. The very different Solo El Solo is very much the same, its sultry dramatic climate over the strolling landscape a magnetic scenery to immerse in whilst the tangy vocals explore a cinematic narrative. Part cowpunk, part rockabilly, and fully spaghetti western intrigue, the track shows further the variety to sound and album which has paraded its raucous charm already, an enticement given another spice by Swamp Thing’s Lover. This song strides purposefully with flexing rhythmic sinews and heavy riffing across thick textures and a consuming atmosphere, its open hooks barbed but respectful to the tempting intensity brewing across the intimidating premise. Both songs leave throat and memory involved long after their departure, though they do have to contend with the quite brilliant pair of Radioactive Dog and Black Roller for that success. The first of the two rumbles and charges down the ears highway from the opening note, the psychobilly spice to the careering groove and spiteful grin to the antagonistic beats irresistible. Settling into its hungry predation, Cecile the temptress to its seductive malevolence aided by great ghoulish harmonies, the song unleashes lethal hooks and a magnificent groove straight out of the Buzzcocks repertoire to steal an even greater chunk of the passions. It is a colossal triumph swiftly matched by its successor, Black Roller a badgering treat with its own insidious groove and heart spearing irreverence. Unleashing biting punk ‘n’ roll with horror punk jaws, the predator is a barbarous dark hearted seducing with Cecille its dangerous Lilith. Joker ignites another spasm of hunger next with its dirty rock ‘n’ roll voracity, discord grazing imagination, and virulently addicting lures before The Man who was The Death swaggers in, its rhythmic hips swerving around the equally wanton guitar adventure and ever riveting vocals. The bass offers a deeper malice in its tempting too which only inflames the appeal of the creative bruising and the epidemically forceful infection, a toxicity which is just as insatiable in Always Elm Street which features guest guitarist Tomeu Destructor. There is a definite Batman-esque lure to the core hook of the song but it only broadens the eager smile and pleasure provided. The next song Rat returns to a wider heavy rock persuasion, guitars flaring up with scorching spirals of sonic invasiveness against refreshing riffs. Though it is an accomplished and skilful blaze, the track fails to reach the heights and reactions of its predecessors. It pleasingly pushes the variety of the release all the same and makes a fine appetiser for the groove infestation of Bloody Stones, a track which spits out cutting riffs, battering rhythms, and searing grooves like it is its last chance. A thoroughly compelling and incendiary incitement, the song has to make way for the closing predatory stalking of Black Suede Night, a final solicitous trap to lose the passions to. We Are The Monsters shows that The Monster Ones has really grown as a band from sound and songwriting to their presence. They are a powerfully confident and inventive proposition now which gives horror punk and rock ‘n’ roll a new thrilling ‘villain’ to drool over. From within the heart of the Palma de Mallorca region of Spain there has stirred in the past couple of years, a fresh and exciting storm of graveyard rock n roll. It comes in the thrilling shape of The Monster Ones, a band which collects the essential essences of various styles and flavours to create a fusion which leaves all fans from psychobilly and rockabilly to punk and horror rock, an energised limb casting explosion of energy. The quintet is a force on the rise and one we wanted to know much more about and find what drives their obvious hunger. So we had the band tell us all. 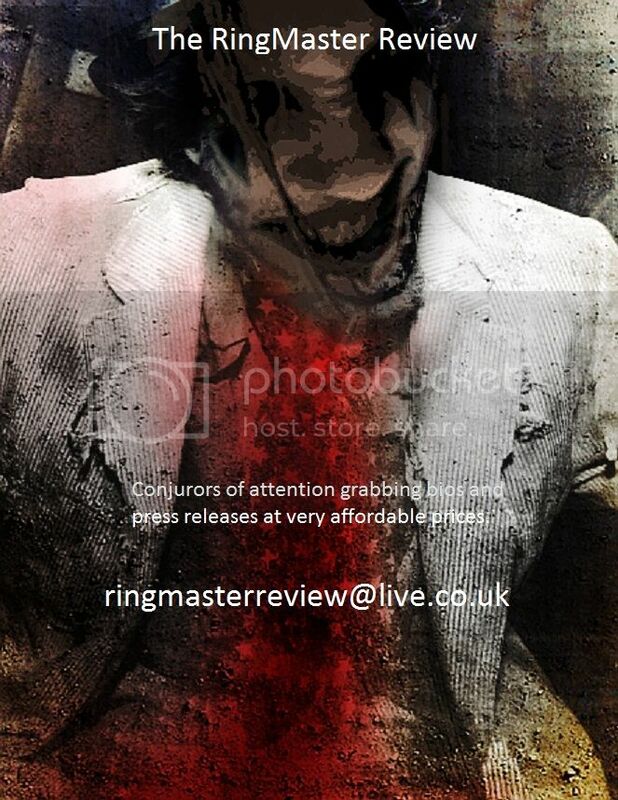 Hi, welcome to The Ringmaster Review and thank you for taking time to talk with us. Firstly would you please introduce the members of The Monster Ones? When and how did the band come about? In 2008, Carpi and Cecile started the band, along with Bukake Kid (bass) and the help of some friend drummers; we collaborated with them in the early shows as we still did not have an official drummer in the band. It was so fun! In just 15 days after getting a place to rehearse, we gave our first concert. We had no idea how to play, but had a great time, and from the beginning we have had the support of our family and friends who have encouraged us to learn and evolve day by day. Your music is a great hybrid of punk, horror rock, glam, rockabilly and more. How do you describe it when asked? Good question! hahaha! We used to call it Horror-Glam-Punk-Rock Band. It’s just what you say … A mixture of many things we love, and we will not spare any of them. Rock ‘n’ Roll is beautiful in all its aspects, and we love to play with them all. From your varied and flavoursome sound one imagines your influences too are wide. Who are the major ones to impact your sound and invention? Many, many influences, yes! We are 5 members in the band that have musical tastes in common as: Misfits, Ramones, Cramps … But each of us, individually, brings his/her own influences too. I am right in thinking the band has evolved from initially playing cover songs to the all original composition making group it is today? Yes, our first show lasted only 20 minutes, and consisted solely of covers of some of our idols (Misfits, Ramones, Turbonegro, Iggy Pop …). But immediately after, we started to compose our own songs. Tell us about the early times of the band and how easy or difficult it was to find a place in Spanish rock music. Well, from the beginning we have this eagerness and enthusiasm to work; we believe that’s fundamental to make a site in the rock scene anywhere. Stay there, no matter what happens … And the harder it is, the more effort we put. Is there a vibrant rockabilly/garage/horror rock scene in your homeland? But really, if you visit the rehearsal rooms or go out to see concerts, you can see that there are great bands of Punk Rock, Metal, Rockabilly and Garage. You released the Transilvania Rock City EP in 2010 and last year the excellent I Wanna Be A Teenage Monster!! EP. How would you say the band has evolved between the two in the aspect of songwriting and the sound itself? In “Transylvania Rock City”, we recorded with a different formation to the present and served as our first experience in a recording studio. Now, together with the current members, we feel our sound and compositions much more defined and worked. In 2012 we decided to start experimenting with home recordings made by Maf (drummer). We recorded our songs in his living room, it was very useful to carefully analyse our music, and in this way we can improve. From these recordings is where “I Wanna be a Teenage Monster! !” was born. It contains four of the most simple and direct compositions of The Monster Ones, of which we feel very proud. In our band we are five songwriters. We all love to create, and we always do it together in the rehearsal room. It’s fun to see how each of us brings something different than expected, but which engages perfectly with the final composition. The songs are steeped in horror, sci-fi, and comic book imagery and essences. Are these areas the major inspirations for your lyrical imagination or do you take the ‘horror’ of every day as a provocative factor too? Horror, sci-fi, and comics are the main inspiration. Also very useful are the dreams and nightmares. In our live shows, we forget the boring real world and focus on the fun. Yes, we like to dress and make-up for every performance … It is a form of expression, and also a way to carry over our audience with us to this imaginary world of horror and Rock ‘n’ Roll. We want them to get into the story and feel part of it. Tell us about Zombie Walk and Zombie’s Party in Mallorca which I believe you helped found in 2010. Is this now an annual event and what do they comprise of? Yes, it is an annual event that takes place every summer, thanks to our friend Adrian Garcia, who makes the hardest work of organizing this. Each year come more zombies, surpassing the 400 undead in the 2012 edition. The route of the Zombie Walk ends with a Zombie’s Party, where we give a show, along with other friend bands, varying in each edition. With the internet have you found a widespread fanbase around the world growing for your sounds? Both updated with latest events and news from the band. How do you feel about the internet and its part in the rise and arguably demise of the chance of success for new emerging bands? It is a very useful tool, both for the bands and for music fans. Where do you hope to find The Monster Ones in five years? Evolved, full of good experiences, with several albums behind us, and many others to record. Stay there and keep rocking! What is next from the band and plans for 2013? In mid-February we’ll get into the studio to record our first LP. Of course, we will continue writing new songs, and we fervently wish to tour outside our home. Thanks so much for sharing time with us, any last thoughts for the readers and fans? Thank you, Pete. It was a pleasure! To all our friends and fans: Thanks for your support, you’re great! Keep rocking with us, guys! And lastly give us five moments which shaped the destiny of your musical direction personally or within The Monster Ones. 1. – The entry of V (Monster-Guitar). Great composer, and gives better shape to existing songs adorning them with his riffs, and Maf, (Monster-Drummer), perfectionist to the limit, which always encourages us to improve ourselves. 2. – The entry of Goatboy (bassist during a year in the band in 2011). He provided great ideas and recorded with us on I Wanna be a Teenage Monster. 4.- Our video clip “Teenage Ramone”, by which we were chosen “COOLEST SONG OF THE WEEK” in New York’s Radio Show Little Steven’s Underground Garage. This has made known our music in many more places around the world. Thanks so much, Steve Van Zandt!!! 5. – And at the end of last year was carried out the voting for “THE COOLEST IN THE WORLD 2012”, among the 50 songs of very great bands. We got to the No. 5, we see it as a great achievement and an honor. This has also been a great help to make our music known to the world.